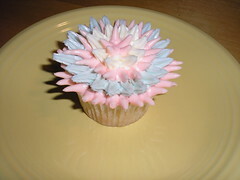 I honestly can not decide if I love this cupcake, or if I am a little bit afraid of it! lla, I think the cupcake is cute! Also, is that picture with your comment a llama?